On the morning of November 11, 1999, a singer and songwriter named Terry Kelly was in a drug store in Dartmouth, Nova Scotia. At 10:55 a.m. an announcement came over the store's PA asking customers to give two minutes of silence at eleven o'clock. When eleven o'clock arrived, the announcement was repeated and the customers stopped and showed their respect for those who had made the ultimate sacrifice in war. All but one, that is. One man, accompanied by his young child, tried to get a clerk to serve him during the period of silence. Terry Kelly is blind, so he couldn't see the man. But he heard him, and it made him angry. From his anger came a song that will, I think, be heard on Remembrance Day for many years to come. When our school children sing the song "A Pittance of Time" at their Remembrance Day service the anger is gone but the message remains powerful. Today, our parish renews its annual Covenant of One, three Sundays when we ask ourselves how we have shared our time, talent and treasure with God and with one another. Today, in particular, we renew our commitment to spending time in prayer. Jesus points us in the right direction in this morning's Gospel. He reminds us of the power of prayer, and of how constant prayer keeps our hearts strong and grows our faith. And the first reading is a beautiful example of keeping up our prayer even when we're weary. But what does Jesus mean when he tells us "to pray always"? Many of us have enough trouble praying sometimes. Father Robert Spitzer offers one beautiful answer in his book Five Pillars of the Spiritual Life. He suggests that we need to have short spontaneous prayers ready at every moment. The first one he proposes is just "Help!" He says that little prayer is enough to bring us a host of graces from the loving heart of God. His favourite spontaneous prayer is one we've all memorized already: "Thy will be done." Father Spitzer says "If we give our problems over to God by praying, 'Thy will be done,' He will bring good for us, others, the community, the culture, and His kingdom out of the most bizarre, tragic, desolate, angering, hurtful, fearful, tempting and confusing dimensions of our lives." Another way to pray always is to develop an awareness that God is working through all the events of our daily life. He is present in good times and bad, always seeking to reveal himself to us. St. Ignatius of Loyola gave us a simple and effective way to find God in everyday life. It's a process of prayer where we look back on our day, with the help of the Holy Spirit, and find God there, We also recognize those moments when we noticed him and those when we may have turned away. 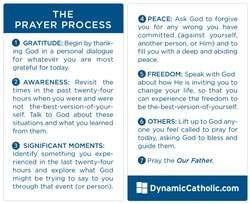 There are numerous approaches to St. Ignatius's method of examining ourselves and our day, but Matthew Kelly gives us a seven-point version that he's printed on a card small enough for a wallet or shirt pocket. We've bought copies for each of you to take home--on one condition! The condition is that you're ready to renew your Covenant of One by pledging to the Lord an hour of prayer. Matthew Kelly's prayer process takes less than ten minutes a day; do it daily, and you've fulfilled that pledge. It's a pittance of time, when you think of it, lest we forget the One whose sacrifice was the greatest of all.